My grandfather died when I was little, but I still remember talking to him. I listened to him in awe, and was amazed at his vast knowledge. Unfortunately at the time I was mostly interested in Swiss Army knives and parachutes and such things, and so that is what we talked about. I wish that I had known enough to ask him about distributism, and about the many Catholic writers whom he had known. 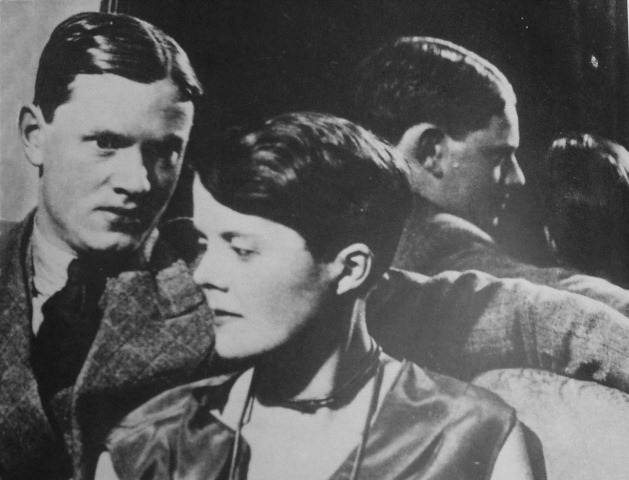 He was good friends with Frank Sheed and Maisie Ward, and knew Dorothy Day, and Josef Pieper, and had met Evelyn Waugh and a great many others. Martin Mosebach is well known in the German speaking world for his brilliant, cutting edge novels for which he received the prestigious Büchner Prize in 2007. But he has also written a collection of polemical essays on the Roman Liturgy from a traditionalist point of view–so far the only one of his works translated into English. This makes him a bit of a puzzle to German churchmen. He does not fit the cliché description of a “traditionalist,” “Latin Mass” Catholic. He seems like a throw back to certain writers of the first half of the 20th century who were both top notch writers and traditionalist Christians. 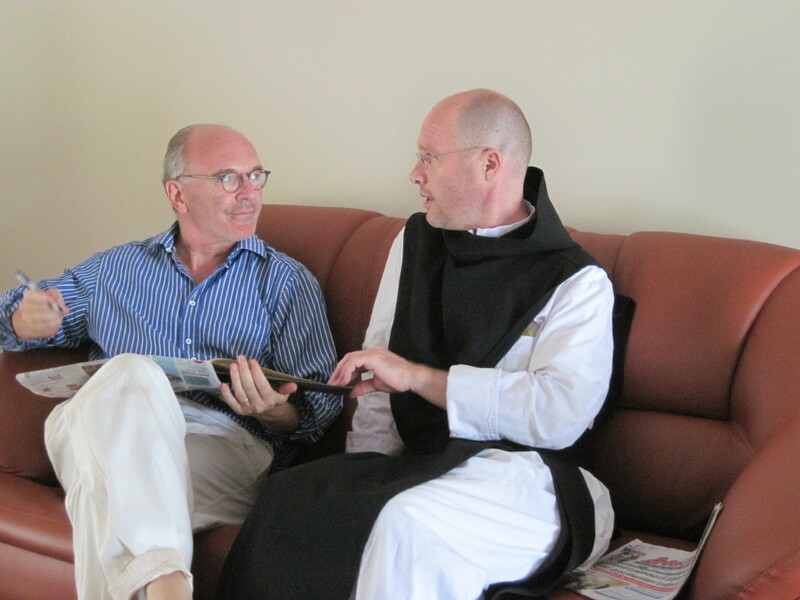 The English speaking world had plenty of these both Catholic (Evelyn Waugh) and Anglican (T.S. Eliot). The likes of Eliot and Waugh provided devastating descriptions of a modern society (“I will show you fear in a handful of dust”) which they considered to have gone astray, and the also proposed the a cure in the form of a return to traditional Christianity. Mosebach might be read this way as well, but there seems to me to be a difference. Comparing the two Mosebach novels that I have read, Der Mond und das Mädchen (2007) and Was davor geschah (2010), to Waugh’s satirical novels there seems to me to be something subtly different going on. To be sure Mosebach is concerned with showing the emptiness of a culture drained of Christian faith and morality just as much as Waugh is, but the difference is that Waugh thinks there is still something to be done about it. Mosebach, it seems to me, doesn’t; he doesn’t think that the culture as a whole has any chance of returning to Christianity. The result is that Mosebach gives a much more detached narration of his stories than Waugh. The narrator of Was davor geschah tells us that one of the characters is not motivated by “predilection for the aesthetics delights of decline and ruin” (Vorliebe für die ästhetischen Wonnen des Niedergangs). But Mosebach does seem to show a keen enjoyment of such delights. Mosebach’s novels are very similar to Waugh’s A Handful of Dust in describing the ruin that people run into by flippant disregard for the moral order, but while Waugh’s book is written with bitter wit, Mosebach’s is written with a kind of aestheticising elegant distance–like a 19th century novelist describing a landscape. Mosebach himself makes something like this point in an interview. There he states that he cultivates an abstract relation to his material, trying to treat his characters like musical themes which he then develops into a kind of symphonic composition. We had passed through a no man’s land in the sleds, but no man’s land has no man’s time. We had moved in a great white bag, as though we were still in the world of the unborn. The wintery forrest in the darkness of the night had made everything appear as though it were not yet inevitable, as though there were many combinations possible, each one about to dissolve again. In the light [of the house] we were back on the tracks on which we had long since been moving. Must I even mention that despite all the good drink that night Phoebe no longer looked at me? 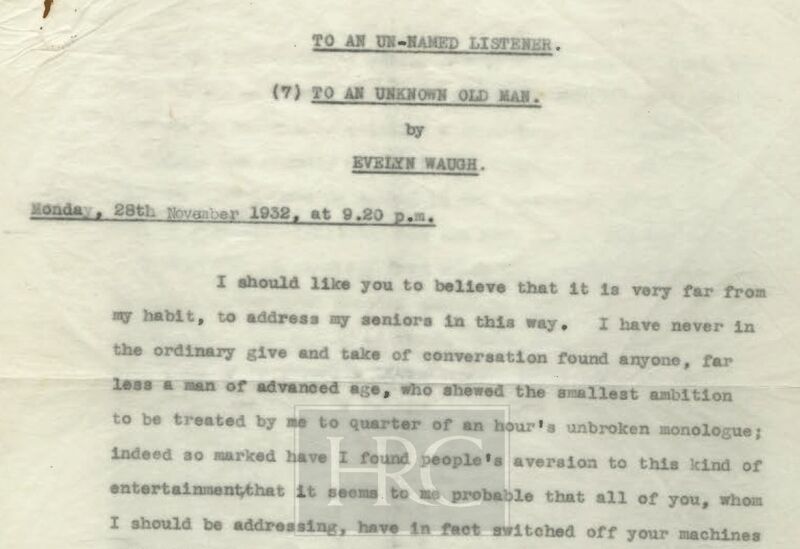 The Harry Ransom Center at the University of Texas in Austin has the typescript of a radio talk by Evelyn Waugh “To an Unknown Old Man.” The following is a wonderfully dismissive passage on progress. (If only the notion were as passé as Waugh suggests). I should like to ask you what it must have felt like to live in an age of Progress. But that is now a word that must be dismissed from our conversation before anything of real interest can be said. I daresay this comes less easily to you than to me because belief in Progress – that is to in a proves of inarrestible, beneficial change, was an essential part, as I understand it, of your education. You were told that man was a perfectible being already well set on the last phase of his ascent from ape to angel, that he would yearly become healthier, wealthier and wiser until, somewhere about the period in which we are now living, he would have attained a condition of unimpaired knowledge and dignity and habitual, ecstatic self esteem. By the time I went to school in the last years of the war, people were less confident and the idea was on its way to the United States of America, from which last refuge of threadbare heresies it has been finally dislodged by recent economic realities. […] nowadays most of us have realized that man’s capacity for suffering keeps pretty regular pace with the discoveries that ameliorate it and that for every new thing found there is one good use and uncounted misuses. […] I do not think that the elaboration of mechanical devices is of any more significance than a change in the fashion of hats, save in so far as both reflect a change of outlook in the users. During a recent discussion involving James Chastek and Arturo Vasquez, I uploaded some texts of De Koninck’s on birth control. 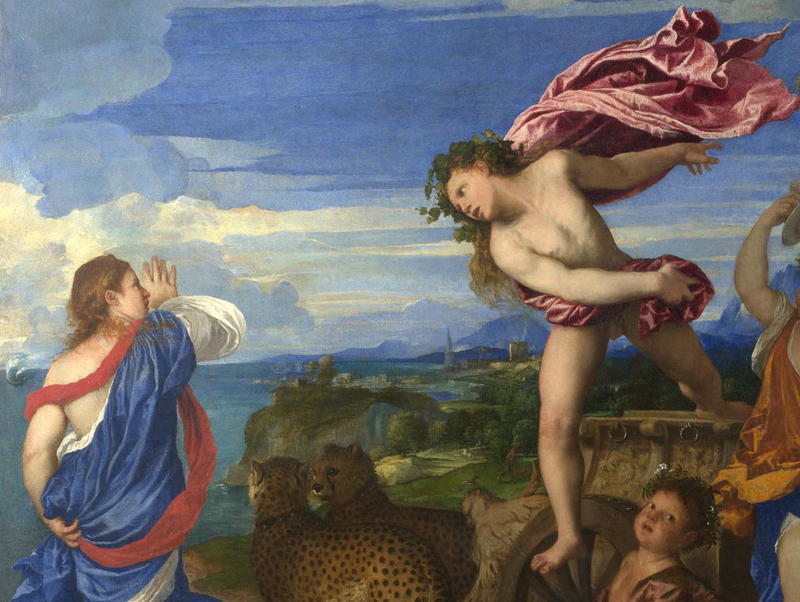 The most interesting paper is “The Question of Infertility”, which argues that infertility is sometimes intended by nature as part of the “bonum prolis”, the good of offspring. I don’t want address the main argument here (I share James Chastek’s assessment), but the exposition of the meaning of “bonum prolis” at the beginning reminded of what I’ve always thought was wrong with Mr. Goodall’s argument in a famous passage of Evelyn Waugh’s Men at Arms. [Goodall] spoke of the extinction (in the male line) some fifty years back, of a historic Catholic family. Guy was less interested in the quarterings than in the morality.